Several years ago on a whim, I visited a clairvoyant, not because I necessarily believe but rather because I thought it was harmless fun. Also, when it comes to things we don't understand, I'm willing to acknowledge that that doesn't mean they aren't real. So, there I found myself with open mind and heart, in a quiet room, softly glowing candles casting shadows on the wall, while a woman did her best to tell me things about who I am and who I was. It was the latter that took things on an interesting turn. One of the first things she asked me was if I have anything to do with yarn or wool. I told her I was an avid knitter, and she told me that in a previous life I was an Irish shepherdess, known for my fine wools. Well, obviously she can say what she wants. It's not as if I can find someone from that past to confirm it. Yet it was a bit eerie, given my lifelong obsession with Ireland. To my knowledge anyway, I've never visited, yet the Emerald Isle has cast a spell on me. The music will set my toes tappin'; images of the cities and countryside give me a sense of home and comfort. Even in grade school my fascination with Ireland was obvious. 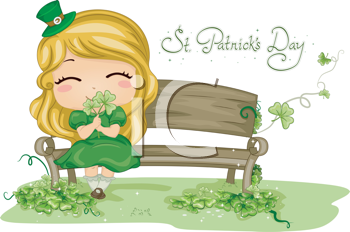 Every celebration as a child is exciting, but I eagerly looked forward to St. Patrick's Day, enthralled by the charming images of shamrocks and leprechauns.